Please email me at nicolle@creative embellishments.com or creativeembellishments1@gmail.com to claim your voucher. As usual please be inspired by at least one of the elements from the picture below and the twist is to use a flourish on our project. >Create a NEW project layout, mini album, tag, card, canvas, etc….as of November 1st, 2017. >Please add your entry to our InLinkz box below to be eligible for the prize. You have until the last day of each month 11:55 pm eastern time to enter. >It is required that you mention in your blog post that you are playing along at Creative Embellishments together with a link back to our blog. Please make sure to reference our challenge. Please, no back linking. (meaning projects from previous months that may fit the challenge) Please link only new projects. > We would love to see you USE AT LEAST 1 OF CE products on your projects but it isn’t required to play along. However, everyone that does will get an extra chance at winning. >WINNERS will have 2 weeks to claim their prize. The winner will be announced on this post the day after the challenge ends. Keep an eye out to see if you are a winner. Now onto the amazing DT reveal. If you want to see close-ups be sure to click on the links above the projects to go to the design team members personal blog. As November comes around the corner, I cant help but think of the autumn harvest, pumpkins and all the warm colours of fall. And the mood board was beautiful this month with the rich tones of reds, oranges and browns. I wanted to make some ATC’s. I absolutely love background work and I never know what I will end up creating when I get going. I started with some simple spray and move to sampling and stenciling with my new favorite stencil the Grid Stencil. The twist was to add a flourish and what better than the pumpkin vine flourish. Here is a video of the creative process. Hi everyone, oh I was so inspired by our monthly image, I just had to play with orange and greens. My starting point was this beautiful mom fox, a picture captured by one of my friends when he was out camping in northern British Colombia. This mom was just a few feet from his campsite. I wish I could have seen her live. The title BEAUTIFUL from the Gorgeous small border word set was just perfect for this image. I simply covered it with Finnabair paint, I love the shimmer it gives the title. The challenge image inspired me to play with chipboard leaves, I love this Autumn leaves set and the heat embossing gives it such a rich color. I encourage you to check out my BLOG for more pictures and details. Autumnus is the Roman goddess of Autumn/the harvest – and the inspiration image made me think of a nature goddess, so I was inspired to create this “Autumnus” Altered Mask. I had a second-hand mask in my stash waiting to be altered – so I started off by painting it with black gesso and then started adding CE chipboard pieces, including Autumn Leaves, Branch and Leaves, and Flourish 26 (for this month’s twist to use a flourish). Once I was happy with the chipboard arrangement, I painted everything with black gesso and then dry brushed on some white gesso to help bring out the details. I misted the mask with two colours of Lindy’s Stamp Gang Starburst Mists (Opal Sea Oats and Ponderosa Pines Olive) and then used Prima Metallique Acrylic Paints in Autumn colours to bring out the details of the chipboard pieces. When I was done adding colour, I added some Prima Metal Flowers, and a metal butterfly and pearls from mys stash and then added some Prima Art Ingredients Glass Glitter in Gold Rush and Mica Flakes in Gold Leaf. I finished off the altered mask by adding some moss green trim I had in my stash around the outside edge of the mask. I was totally inspired by the fall colours and then used fall/ autumn accents to decorate my Canadian Thanksgiving with family and friends photo. I used both natural chipboard and some copic coloured. The autumn word set for title finished off with some of the acorn clusters were a perfect fit for this page. With my group photo I used and amazing calligraphic frame to showcase my photo. Add all this to my fall paper and stickers… I love it… it’s perfect. Hello, this is Marci and Happy November! This officially starts the busiest time of year for most, including me! So I try to stay ahead on my crafty fun to have and keep it fun! I was inspired by the feathers/butterflies and flourishes are on the bottom of each Artist Trading Card. Hope you can find a little time to join us this month! Creative Embellishments PRODUCTS USED: Wood Feathers : used silver gelato and edged with blue distress ink. Small Flourish: colored with blue distress ink. I was inspired by so many things in this beautiful image…the colors, the leaves, the butterflies and of course the theme! I used a photo of my husband and I last year which was perfect for the CE Falling For You title! I also used the Branch and Leaves, dragonfly, and Maple Leaf Flourish! This month’s challenge picture inspired me to use a frame around my picture. I used the Rectangle Flourish Frame 3, which I altered with black chalk ink, and I also used rhinestone and pearl flourishes. For my title, I used the word “cherish” from the Moments Word Set, which I painted with gold paint. Hi Everyone and Happy November! I love the inspiration photo this month, loving all of the fall colors! The twist is flourish and I have used pieces from Flourish Set 15 and a Flourish Page Corner 5. I also tucked in behind the fairy a Layered Wing and finished it all off with a sentiment from the Inspire Word Set. Have fun playing along and I can not wait to see what you make!!!!!!!! This moodboard image inspired me to create a card with a typical fall colour palette and details. I was inspired by the beautiful, warm colours in the image and by the leaves. So I decided to use the Branch and Leaves set on my card. I cut the branch a little smaller to make it fit the size of my card. The branch was only slightly inked with brown ink. After that, I heat embossed several leaves with gold embossing powder and attached them on my card. The large leaf comes from the Twig Frame with Fall Leaves set. I was inspired by the fall colors in the beautiful image. I created this tag using similar colors and with a Thankful sentiment that goes perfect for the season. 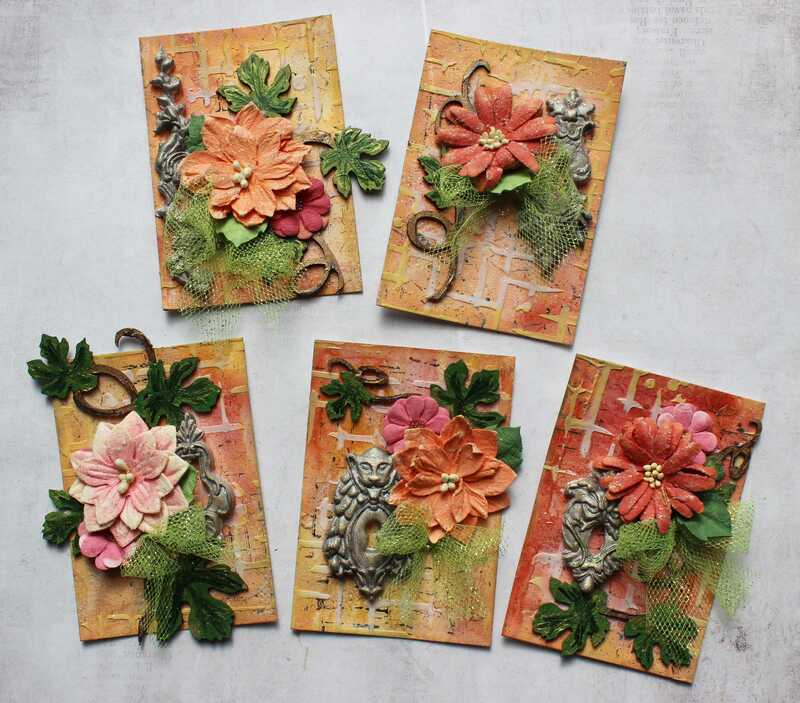 I used Creative Embellishments product like the Flourish Corner 2 that I painted with distress oxides. I stamped randomly with the Distressed Text Stamp. I gave textures on the background with the Fairy Dust Stencil and Copper glitter paste. Please link your project below for a chance to win a $50.00 gift voucher to our store. Can you still play along if you don't have your own blog? Monika, Thank you ever so much for your beautiful message!! You are so sweet! We hope to see you join us here!